We’re back with another author interview today, this time with Short Flights bundle contributor, Linda Maye Adams. 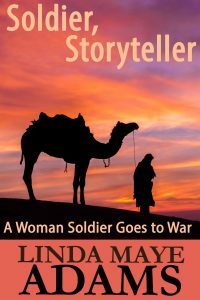 Linda lives in Northern Virginia, and enjoys writing science fiction, fantasy, and mystery, particularly military sci-fi, drawing on her own background and experiences. She keeps a website at lindamayeadams.com if you’d like to learn more. SDR: Tell us a little about the story you have in the Short Flights bundle. 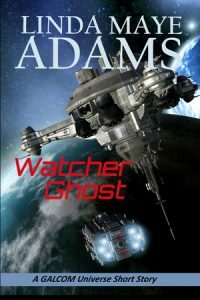 LMA: My short story is called “Watcher Ghost.” Hope Delgado was recruited by GALCOM, a space military command, because she is the only person who can see and talk to alien ghosts. She is called to an older space station because the ghost haunting it has become violent and she has little time to figure out what he’s trying to tell her. SDR: I absolutely love the idea of this story! Now, what’s your current writing project? How do you feel about it right this minute? 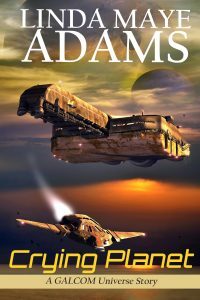 LMA: It’s the third book in the GALCOM Universe series, called Cursed Planet. Hope Delgado’s on a planet drop to assist Alien Affairs with a mediation over a ghost. But the aliens are hostile to humans and they are difficult to communicate with. I’ve been embracing my nerd side with this one big time—we have zero-gravity, meteorites, and even an aurora. So a lot of fun playing around with the cool side of science. SDR: Do you remember what sparked the idea for your story in the Short Flights bundle? What was it? LMA: I was working on the first book in the GALCOM Universe series, Crying Planet, and saw an anthology call. It had just hit me that Crying Planet was actually a series, so I gravitated straight into a short story with the same character for the call. The idea was a haunted space station. The bug sensors came into this story first, so I was adding them in the novel. I think I’ll have one of them floating by in zero-g in my newest story. SDR: I’m always interested to hear how other writers work. Are you a planner/outliner/architect or a pantser/gardener/discovery writer? LMA: I’m a pantser. It’s both terrifying and exhilarating to start a story because I truly have no idea what’s going to happen next. I have to write it to find out. It’s kind of like sailors in tall ships going out on the sea with only a general idea of where they’re going and then they discover the island with the lost treasure and gets caught in a nasty storm that hadn’t been there five minutes ago. It’s always an adventure. LMA: When I was growing up, there wasn’t much for girls unless it was a romance or Nancy Drew. I liked reading science fiction and adventures, and yet, if there was a girl in the story, she was usually wallpaper. The guys always got the adventures, and the girl got to be rescued. And then I saw Star Trek and Uhura on the bridge in this important and visible role. Even though she didn’t have many adventures, it was a lot more than what I was seeing at the time. So I write about characters I want to see, having adventures. SDR: What’s the most challenging thing about being a writer in 2018? And what’s the best thing? LMA: The most challenging thing is discoverability. There’s a lot of books out there, and it’s hard being found in the sea of them. I want to write full time eventually—have always wanted to—but discoverability is happening at its own speed. The best thing? I can write books about women having adventures and no one’s going to reject them as not being marketable based on an executive’s fear of the risk. Indie really has opened a lot of doors, and places like Bundle Rabbit offer so much exposure. SDR: Thanks so much for stopping by and chatting with us, Linda! The Short Flights bundle from BundleRabbit is available now across many online platforms. Along with Linda’s story, you’ll find nine more single stories and five full collections in the bundle, enough short fiction to keep you reading for a while! At just $4.99, it’s a real steal, so don’t miss it. Still more interviews to come!